Infections with Salmonella bacteria, often caused by eating or handling undercooked meat or eggs, affect about 100 million people a year worldwide. The suffering the infection causes – abdominal cramps, fever and diarrhea – is the result of an extremely precise set of molecular interactions between the bacterium and the infected human's cells. In a new study published in the Journal of Biological Chemistry, researchers at Imperial College London and the Francis Crick Institute report some of the details of how Salmonella shuts down an immune pathway after infection. 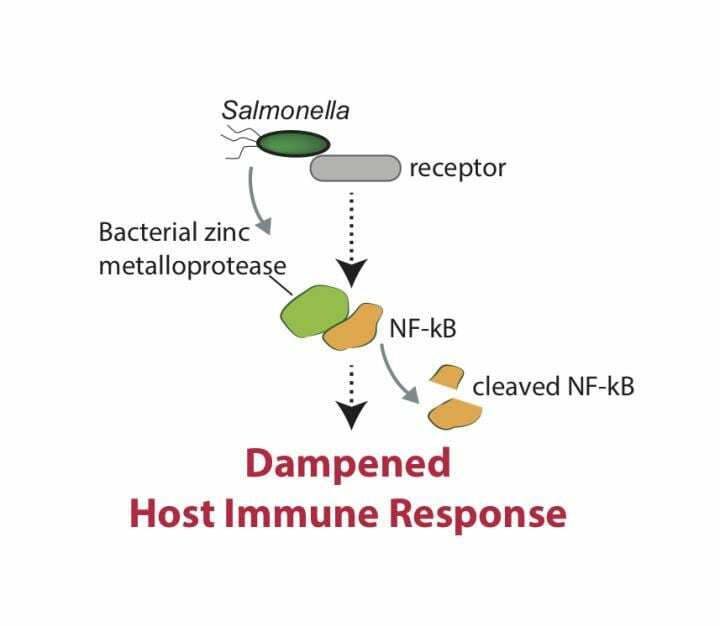 The precision with which this occurs – targeting only three out of five NF-kappaB proteins – is strongly determined by the way the bacterial effectors interact with a single amino acid in the targeted NF-kappaB proteins.